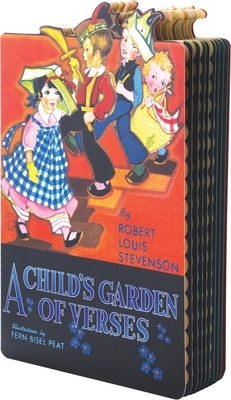 We are pleased to present our delightful shaped version of A Child's Garden of Verses by Robert Louis Stevenson with illustrations by Fern Bisel Peat. The collection first appeared in 1885 and has proven popular with children and their parents over the past 100 + years. We were drawn to reprint this version especially, for the appeal and high quality of the illustrations and how well they fit with the poems chosen. This version is designed specifically with the very young reader in mind, hence the bold and colorful artwork and selective offering of poems. It includes: The Lamplighter, The Land of Counterpane, Bed in Summer, My Shadow, The Swing and more. Scottish writer Robert Louis Stevenson (1850-1894), in addition to giving us the beloved "A Child's Garden of Verses," is also the author of such timeless works as "Treasure Island," "Kidnapped" and "The Strange Case of Dr. Jekyll and Mr. Hyde. "Little is known about American illustrator Fern Bisel Peat but her stylish illustrations tell of a gifted artist. Her contemporary yet adorable children are as fresh today as they were in the 1930's.